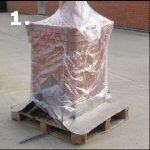 Lift into position on to the timber trusses using the 7.5t lifting eyes. Once in position remove lifting eyes. 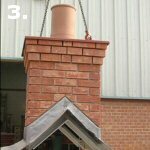 An End Ridge Chimney should be bedded into 10mm of mortar or 5mm of sealant. 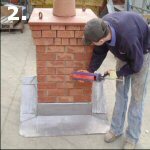 Sit ALL chimneys on a layer of under-slate felt. 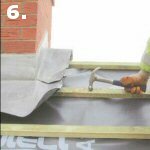 Ensure this is left long enough to overlap the roof felt. 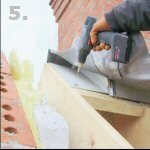 Drill through the chimney brackets and bolt to the trusses using the stainless steel screws supplied. (6no per apex bracket, 3no per side bracket). 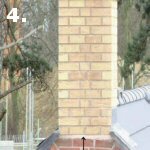 Batten over the chimney brackets. Tile the roof. 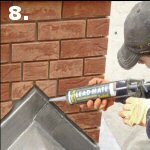 If Chimney supplied unleaded, apply lead sealant to the 10mm mortar joint gap before and after flashing. 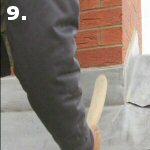 The Code 4 lead is then dressed securely into the 10mm mortar joint. 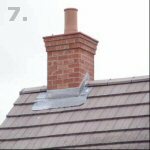 The Flashed Chimney is then dressed to the Roof.